You just had your sparkly new digital antenna installed, but you’re not getting the most reliable TV reception. Frustrating, right? But this issue is a lot more common than you think. So, let’s dive into why this is happening and what you can do to fix it. Usually, if you have reception problems, the picture will break up or freeze on your digital TV. Unlike analogue TV, it won’t look snowy or fuzzy. In fact, a weak TV signal can still show up clear but then cut in and out. If that’s happening to you, it’s most likely a reception problem. If you’re experiencing reception problems, you’ll need to get a technician out to diagnose the issue. But if they confirm that a weak signal is the issue, they’ll likely recommend a TV amplifier as the solution. An amplifier works to correct weak signals in your antenna. Sort of like an audio amplifier that can take a small noise and make it much louder, an antenna amplifier can take a weak signal and make it strong enough to broadcast channels, pictures, and sound on your digital TV. This is especially important with digital TV because if the signal isn’t strong enough, you won’t get any picture or sound at all. (Back before digital TV, you could usually get fuzzy reception when you had a weaker signal.) But the good news is that if you can increase the signal enough with an amplifier, you should be able to enjoy the full TV experience, with a clear picture and sound. Are There Different Types of TV Amplifiers? These look like a small plastic box (usually black or grey) that’s attached to the lower part of your TV antenna. Occasionally it’s hiding inside the roof and won’t be visible from the outside. You should be able to see wires connecting your antenna and masthead amplifier, and wires also running down into your roof and home. Masthead amplifiers are the most common type of amplifier used in residential free-standing homes in Australia. They’re mainly used to boost the signal if your location has bad coverage and interference like large buildings and tall trees. Distribution amplifiers are usually a lot bigger than masthead amplifiers and if you need one, it’ll get installed either inside your roof, a cupboard, or a service duct. Distribution amplifiers are mainly used in units or flats where there are multiple homes and TVs connected to one antenna. Or you might need a distribution amplifier if you have multiple TV wall points installed and this is causing your signal to weaken. Is There a Difference Between Amplifiers and Signal Boosters? No. In the digital/antenna industry, these words are used interchangeably. They both refer to devices used to boost or amplify your TV reception and signal. How Does a TV Amplifier Work? An amplifier is powered by the antenna cable that runs from a 240-volt plug near or at the back of your TV. When your antenna picks up a weak signal, your amplifier will boost, repeat, or amplify this signal to make it clearer and help transfer the data to your TV. That way, your TV can get a signal that’s strong enough for it to work, even if your antenna isn’t able to pick up a strong enough local signal directly. Should We Add an Amplifier Just In Case It’s Needed? So, if you don’t need an amplifier as part of your digital antenna installation, don’t get one. And if your antenna technician suggests adding an amplifier, they should be able to give you a good reason why that doesn’t include “just in case”. As you can see from the list above, there’s a lot at stake here, especially if you don’t need an amplifier, or if it’s done wrong. So, just like your digital antenna installation, it’s important that your situation is properly assessed, and your amplifier is installed by a professional. Step 1: Your technician will diagnose your signal strength, check for other issues, and perform any other necessary assessments before they even start your installation. Step 2: Then they’ll choose the right type of amplifier for your situation. Step 3: They’ll carefully install it in the ideal location (whether it’s on your roof, inside your roof/attic, or in a cupboard). Step 4: And they’ll test it to make sure your amplifier isn’t causing interference and make sure you’re getting the right signal strength to your TV so you can enjoy good reception and a clear image. It takes experience and specialist equipment to properly and safely install an amplifier, so don’t attempt to do this yourself. Do you need a digital antenna installed? Or think you might need an amplifier to improve your weak signal and get better reception? We can help. 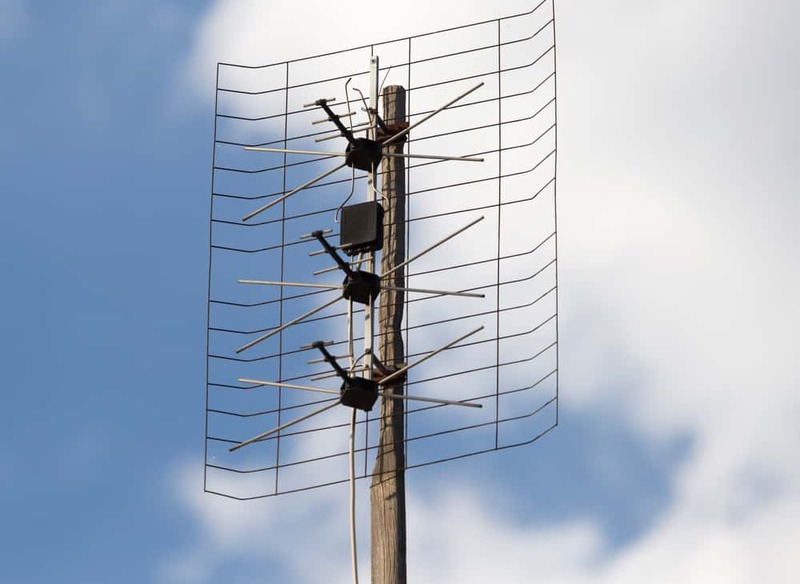 Call us on 1300 800 123 for a free quote or to book a digital antenna installation and we’ll send a technician to your place.